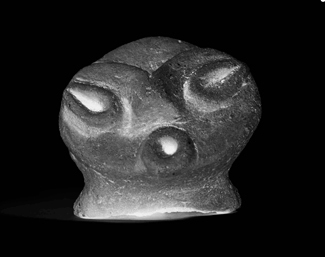 The Institute worked on a large AHRC funded project in 2009 to 2011 examining dogū, or clay figurines, from the prehistoric Neolithic culture of Japan. From this project, new links were developed including that with the award-winning photographer Kuwashima Tsunaki whose works were displayed at Gallery 18/21 in Norwich at the same time of the exhibition unearthed at the Sainsbury Centre for Visual Arts. He celebrates his first UK solo exhibition in London this summer and the Institute is pleased to host a special lecture delivered by the artist at the Institute on 21 August. This issue explores the world of Kuwashima Tsunaki and his obsession with images of Japan’s ancient past. With his jet-black goatee and swished metro-sexual coiffure paired with a thick set of concentrated brows, award-winning photographer Kuwashima Tsunaki is in a sense a burly contemporary version of Japan’s Neolithic Jōmon man. His work is equally wild and passionate. For over a decade, he has built up a body of work referencing the archaeological past of Japan and more specifically of the Jōmon period (c. 14,000-300 BC). He photographs excavated Jōmon clay figurines, or dogū, and pots to pursue his longstanding fascination with how we connect and continue to relate with our ancestors. Kuwashima’s work is highly acclaimed for its unconventional, mesmerizing and at times haunting style. In his upcoming UK solo exhibitionThe Eternal Idol in London, he uses both photographs and installations that reference Japan’s archaeological past. He harks back to the Neolithic Jōmon, as he sees it to be the foundation block contemporary Japan is built on. 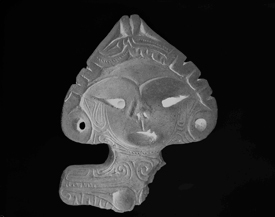 Jōmon, as the first culture to produce earthenware and the longest to maintain a continuous ceramic tradition in the world, left behind hoards of artifacts that excavations continue to uncover. 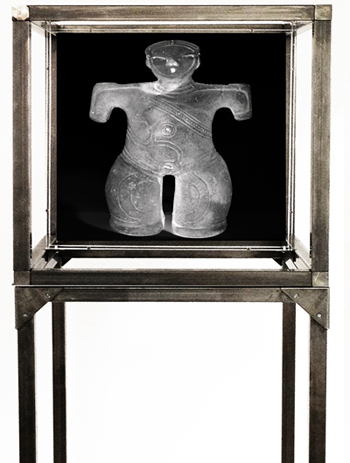 Often found as fragments, these objects act as a window into the worldview of the Jōmon people thousands of years ago. Kuwashima, in his slow, measured way of speaking, says his job is not about making assumptions about the meaning of each object, but to be—through his photography—a vehicle to communicate the power and voice of these artifacts from the ancient past to the 21st century. The abstract sculptural forms of Jōmon ceramics are indeed powerful means of communication, which many in the UK were able to experience through the exhibitions The Power of Dogū (2009) and Flame and Water Pots: Prehistoric ceramic art from Japan (2012-2013), both at the British Museum, and unearthed (2010) at the Sainsbury Centre for Visual Arts. Whether it is the compilation of motifs that appear on the bodies of dogū or the medley of dynamic designs exploding out from the vessels’ body, the potent and complex narrative that makes up the artifacts is palpable to viewers irrespective of culture and time. And yet in archaeological excavations many of the same objects said to possess eternal spiritual powers are found with deliberate breakage patterns and strewn in a way to suggest they were discarded. For instance, at the Shakadō site in Yamanashi prefecture alone, over 1,000 different dogū fragments were unearthed, most with body parts missing, despite the settlement being extensively excavated and all finds having been meticulously recorded. According to Professor Kobayashi Tatsuo, a senior figure in Jōmon archaeology, many dogū were intentionally made with weak break points for ease of dismembering, coined the ‘chocolate bar’ method, as part of a ritual act. In fact, the Agency for Cultural Affairs’ Harada observes that these fragmented dogū most likely played an important role in some ritual ‘sending off’ ceremonies with pieces of their broken bodies being distributed around the community. Observing his installations, however, it is evident that Kuwashima is no wide-eyed romanticist drunk on nostalgia about the ancient past. In fact, he is more interested in the hidden Jōmon message: that of death and decay. He argues that to rejoice in life is to accept death, and to seek eternity is to fear mortality. These opposing forces are articulated most clearly in the materials he chose to use in the exhibition. For instance, his uses of different printing techniques convey the concept of decay. His platinum palladium prints are on paper no longer in production, or ‘extinct’, yet the ghostly images continue to be present. The collotype prints, known for their exceptional archival longevity at a premium cost, will preserve the images of the Jōmon ‘eternal idols’ much longer than inkjet prints, the most widely available method of printing with colorfast stability of a mere 25 years. Perhaps eternity is a manifestation of desire rather than reality. Even our desperation to cling to something precious and ephemeral is questioned in the exhibition. The ‘CUBE’ installation he presents investigates the way in which we attempt to rescue, protect and preserve ‘eternity’. By literally encasing images of ‘eternity’ in untreated steel framed boxes he calls the CUBE, Kuwashima challenges us to consider whether ‘eternity’ ought to or can be wrestled into a box for safekeeping. Given time, these steel cases will eventually rust and follow their own natural decaying process. Professor Nicole Coolidge Rousmaniere, Research Director at the Sainsbury Institute, observes that his photographic style strives to seek the very essence of his subject matter: ‘his images are compelling as they suggest an unspoken narrative. He creates an emotive world without words’. As the eternal Jōmon stories unfold, Kuwashima stands ready with his lens to capture and re-tell the never-ending story. Tsunaki Kuwashima was born in Yoshiwara, Tokyo in 1972. In 1994 he moved to London to study fine art and photography at Central St. Martins College and The London College of Printing. He returned to Japan in 1998, opening his own studio in Yamanashi where he worked professionally in advertising and magazine photography. Since 2000 he has made work focusing on Japanese culture. He has exhibited both nationally and internationally with works in The British Museum, V&A and Sainsbury Institute for the Study of Japanese Arts and Cultures. Discussant: Andi Sapey is photographer based in Norwich, Norfolk and is Lecturer at Norwich University of the Arts. He specialises in documentary photography, often depicting travel, people, education, musicians, theatre performers and visual artists.